New Posh skipper Alex Woodyard. New Posh skipper Alex Woodyard has become used to success. The 25 year-old reached an FA Cup quarter-final and won the National League title with Lincoln City in the 2016-17 season. And last season he helped the Imps to the League Two play-offs and to victory at Wembley in the Checkatrade Trophy FInal. But Woodyard, one of five central midfielders signed by Posh boss Steve Evans in the summer, is confident moving to Posh in the summer will lead to even greater riches. “I’ve had a great couple of years at Lincoln,” Woodyard said. “There has been a lot of success and a lot of great days, but I’m confident that success will continue at Peterborough. “It’s why I’m here and I’m delighted I made the move. The place has been buzzing this summer. “We’ve signed some great players and some great lads and even training has been competitive. We’ve scored plenty of goals in pre-season. “There is big competition for midfield places which can only be good for the players and the team. “The manager has signed some top players in that position. “We know we have to perform every day in training and in matches as there will always be a good player waiting to come in and take your place. “There are exciting times ahead. I’m confident we can have a great year and get promoted. “Being given the captaincy is a huge honour. It feels amazing and I’m very proud to be catain of such a great club. “I’ve skippered sides before and I enjoy it. “But these days captaincy is more than a one-man job. There are many players on the pitch who can act as a captain. The priority for all of us is help each other. “The captaincy has just made a new season even more exciting for me. “Most seasons lately I’ve managed to play in a higher division than in the season before and League One is the next step for me. Woodyard’s departure caused a brief period of mourning at his previous club. The defensive midfielder had followed the Cowley brothers from Braintree to Sincil Bank and quickly became a key man in a terrific success story. 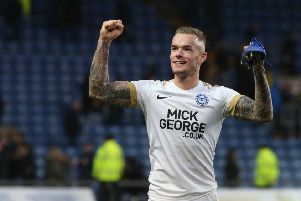 Posh fought off late interest from Championship outfit Ipswich Town to sign a player manager Steve Evans described as his ‘major summer target’. New right-back Jason Naismith will be the Posh vice-captain.